Keep tabs on your moles and remove trouble spots. If you have many moles, a history of skin cancer in your family or excessive sun exposure, you should regularly examine your body for signs of change. Moles that become asymmetrical, develop irregular borders, have uneven colors, grow in size or change shape could develop into melanoma, a type of skin cancer. A thorough physical examination can be further enhanced with our cutting-edge mapping system, which can help track changes in moles and guide our dermatologists to skillfully remove any problem spots, if necessary. If you’re at higher risk for melanoma and other skin cancers, mole mapping could be life-saving. This skin surveillance technique catalogues all of the moles on your face and body. Camera settings are automatically adjusted for follow-up images taken during later visits. The mole mapping procedure is quick: the visit only takes 30 minutes. Photos are taken in a private room, then stored securely in a digital database. One of our physicians will review your skin every 6-12 months and compare them to earlier maps, flagging any new or irregular moles. Aside from using sun protection, early detection is one of the best ways to prevent melanoma and other skin cancers. 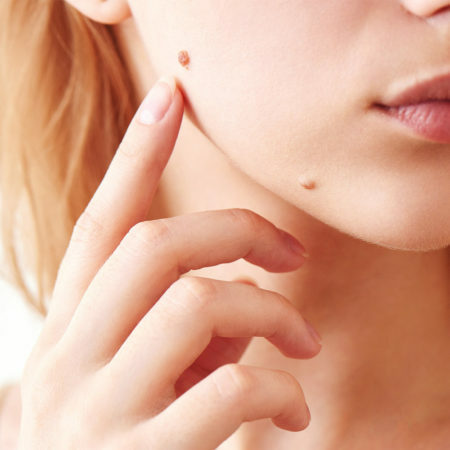 Since the risk for melanoma increases with the number of moles present on the skin, ideal candidates for mole mapping have multiple moles that may be irregular. If you and your dermatologist have decided a mole will be removed, there are several ways to do it, and it usually only takes about 10 minutes per spot. If your dermatologist spots an “ugly duckling” (changing mole that is different from your other moles), he or she may recommend a biopsy. The procedure involves numbing the area first, followed by removal with a round blade called a “punch” or a scalpel blade. Depending on its size, a suture or sutures are placed. The tissue sample is then sent to a pathologist for examination under a microscope. Be aware that the bigger or deeper the mole, the more likely it is for the removal procedure to leave a scar. A mole may be removed for cosmetic or practical reasons. A mole may be undesirable even though it is harmless. Elective and cosmetic mole removals are performed commonly at our clinic. Once the area is numbed, the doctor can shave the mole with a scalpel or zap it with a laser. These techniques require little to no recovery time compared to traditional surgical removal if the mole is too large or complex for the other methods. Your dermatologist will discuss the possible options with you to achieve an optimal cosmetic outcome. What is the aftercare following mole removal? Generally speaking, keeping the treated area covered with AquaphorTM or VaselineTM will protect it and accelerate healing and prevent infection. Your dermatologist may recommend keeping the area covered with a small bandage for a few days. The area can be gently cleansed with soap and water starting on the day after the procedure. Contact our clinic if there are any signs of infection. If a suture is placed, we will arrange for you to return for suture removal 5-14 days after the procedure, depending on the body site. Do I need a referral for mole mapping? Yes, your doctor will need to send a referral for the office visit and mole review. Yes, there is a fee for the mole mapping procedure. Contact our Vancouver clinic for more information.